As an Interior design and Landscape Designer I am often confronted with the fact that clients want to realise their dreams from scratch using new furnishings for their home or new landscaping materials to make their perfect garden. Being green does not mean joining the lentil and flower brigade. Nothing wrong with lentils. I adore them, and I of course I love flowers! Just as design need not be either exclusively about either function or form, being ecologically-led need not be drab, old fashioned or inelegant. It makes sense financially, it is important for our environment and and is easily done. The Code for Sustainable Homes kicks in this year; new housing will need to meet certain sustainability, carbon emitting and other more general environmentally friendly criteria. But we still have no guidelines for interiors or indeed gardens and landscapes. So why wait for someone else to do something? Professionals advising clients should all go out of their way to educate, share and advise them on more sustainable materials and methods. The key is to be prepared to invest time and adopt a more forward-thinking process when sourcing materials. Ask suppliers to show and demonstrate their green credentials or manufacturing process – not always easy and not always available. We now ask for these credentials as part of our assessment when we look for new suppliers but crucially we also annually review our suppliers and see how they have improved if at all. It is about an open dialogue between manufacturers and specifiers and the public, after all we all have to make an effort. Keeping it green is not just about recycling of course, it’s about looking at the whole supply chain, how it is made, where was it made, who by and even though you may be recycling by buying used, second-hand items, do ask how they have been recycled. Sometimes the recycling process is more labour intensive and energy intensive then making from new – duplicate manufacturing as I call it. Two times energy requirements, two times energy output and two times potential waste output. For my clients who are keen to help themselves and try their hand at re-using and recycling I point them towards this website, Design Sponge, a design website, showcases the before and after of kitchens, bedrooms, tables as well as re-interpreted accessories such as old suitcases & picture frames. It’s contemporary, modern and right on the button in keeping it green. They show you how to do it on a budget without compromising on designer looks. 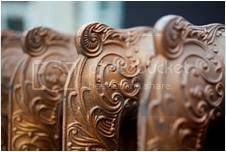 An American website but so far the only I have found who really looks and shows people how and what to do to breathe new life into furniture. For lighting, we have an English company we lke very much, Skinflint Design, dealers in reclaimed lighting from the 20th Century. 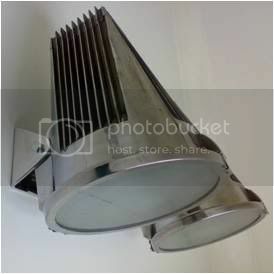 They have an extensive range of fabulous industrial fixtures from the 1900’s to the 1960s such as these wall lights. The company is a specialist in lighting design and sourcing industrial lighting – fully compliant with today’s standards, these lights easily fit into any interiors where a mix of old and new is appreciated. 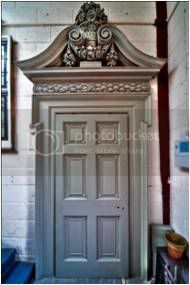 I’m a big fan of reclamation material as offered by MASCo Architectural Salvage near Stroud and now also present in Bath. They sell reclaimed landscaping materials such as bricks, flagstones, granite setts and Cotswold stones for example. These are perfect for matching up with existing materials in a new garden commission but they are also perfect for starting anew! 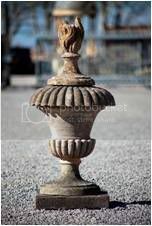 From bird baths to statuary, to chimney pots as planted features, an architectural salvage yard can be a source of inspiration and a treasure trove of unusual items. Materials with patina set into a new crisp modern design can showcase the perfect juxtaposition of old and new, sitting comfortably together. I love this door again from MASCo, I can see it even a very crisp modern interior – flanked by glass walls for example. The door becomes work of art. Georgian floorboards are much wider than those we use today so unless they are riddled with woodworm and beyond repair, try to source from salvage yards as you will not find new wooden boards that are wide enough. Remember that Georgian wooden floors were often painted and this can often hide a multitude of sins. Sanding the boards and re-painting them is often a wise move but be prepared to unearth some problems! 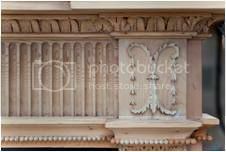 When re-painting plasterwork in a period property it is good to use soft distemper as modern paints are so thick they clog up the plasterwork and smooth over the detail. With distemper, mistakes are easily rectified with hot water and a soft cloth. It is easy to apply and also greener. Don’t replace that Georgian fireplace or any period fireplace because it looks a bit shabby or damaged. Have it refurbished. The patina can never be replicated with modern copies and some wear and tear adds to the overall effect. Lastly, do not live in the past! If you live in a period property don’t try to re-create the style and era of the time by filling your house with period furniture, fabrics, soft furnishings and anything else you can find of the era! Try to retain as much as possible of the architecture detailing such as wood work, plasterwork, fireplaces, windows and floorboards, but still live in the 21st century. Modern furniture can look stunning in a period setting. It is all about striking a balance between historical accuracy and the contemporary requirements of modern-day living!